DA Form 5017 or the "Civilian Employee Consent Statement" is a Department of the Army-issued form used by and within the United States Military. The form - often incorrectly referred to as the DD form 5017 - was last revised on November 1, 2001. 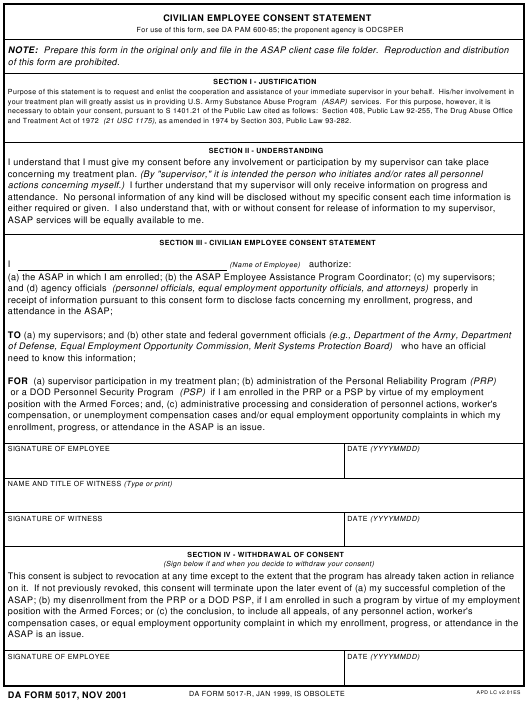 Download an up-to-date fillable DA Form 5017 down below in PDF-format or look it up on the Army Publishing Directorate website. of this form are prohibited. and Treatment Act of 1972 (21 USC 1175), as amended in 1974 by Section 303, Public Law 93-282. ASAP services will be equally available to me. enrollment, progress, or attendance in the ASAP is an issue.